Steve Sudell lives in sunny Venice, CA with his wife, Lindsay, and their two great dogs. He has been a Crossfit competitor since 2012 and specializes in working with high-intensity athletes on their mobility, prehab, and post-injury physical therapy. Steve received his Clinical Doctorate of Physical Therapist in 2009 and finds the human body to be the most extraordinary machine ever built. What type of sports did you play as a child? Primarily organized baseball, soccer, and tackle football, but I was also very active with surfing, skateboarding, etc. How did you come up with the concept of the Neck Hammock? As a physical therapist, I’ve seen a gradual uptick in patients complaining of neck pain. I could treat them at the gym, but there was nothing I could give them to use at home. All of the at-home products were either cheaply designed and ineffective or were expensive, big, and bulky. So one day I was working out, tweaked my neck, and wanted to give myself cervical traction so I grabbed a band wrapped it around a pole and the back of my head…10 minutes later, my neck pain was gone. I knew that I was onto something, but my biggest challenges were making it comfortable, portable, and affordable. 2 years later, here we are. It’s easier to visually explain it! Here is a video I posted explaining how the Neck Hammock works. 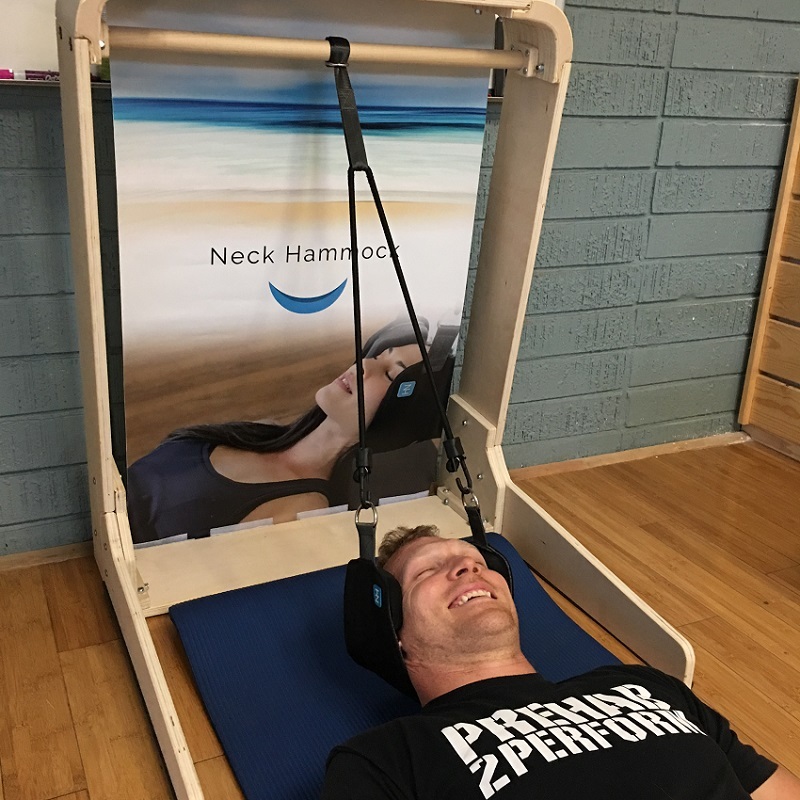 What are some of the health benefits of the Neck Hammock? It is limited to just the Neck. By gently decompressing the cervical vertebrae, the muscles of the neck and shoulder gradually stretch/relax which can lead to decreased neck and shoulder pain, decreased stress, increased energy from improved blood flow, improved sleep quality for meditative benefits, promotes proper alignment which improves posture. We’ve had multiple patients report decreased tension headaches and even improved low back/ SI pain. Who should avoid using the Neck Hammock? Those with Acute Cervical Injury, Spinal Instability, Spinal Hypermobility, Neck Tumors, Rheumatoid Arthritis, Osteomyelitis, as well as those under the age of 16. What type of stretches or treatments are a good compliment to the Neck Hammock? While using the neck hammock we LOVE and highly recommend: 1) wearing an eye mask to eliminate bright lights 2) putting on meditation music 3) place some pillows under knees to support low back. We also suggest supplementing with any stretch to improve posture, this will help accelerate the benefits of the Neck Hammock. This includes: Stretching of the pecs, lats, and thoracic spine. We also recommend scapular strengthening exercises to improve posture. Want more information on the Neck Hammock? Check out the website!